Though Coogan's the avowed funnyman, twinkly-eyed Dench makes beautiful comic music with him...and though Dame Judi's the classically trained tragedian, Coogan holds his own when matters get serious. 98 min. The Weinstein Company. Director: Stephen Frears. Cast: Judi Dench, Steve Coogan. In 1952, Hollywood star Jane Russell adopted an Irish-born baby, prompting controversy and headlines like "1,000 CHILDREN DISAPPEAR FROM IRELAND." Money had talked, and shady officials had issued dubious passports condoning the export and sale of Irish infants. That story died down, but thousands of Irish children were indeed spirited away. Now the film Philomena takes the perspective of a wronged Irish mother coerced, in 1952, into giving her baby away. In investigating his exposé The Lost Child of Philomena Lee, journalist Martin Sixsmith explored a longstanding mystery by cracking a remarkable case study. Co-producer and co-screenwriter Steve Coogan stars as Sixsmith, recently sacked as an adviser to the Labour party. Lacking direction, he's prone to a lead about Philomena Lee (Judi Dench), the baby she birthed out of wedlock, and her fifty-year distress after her baby was adopted against her wishes. Though he believes human-interest stories are for "vulnerable, weak-minded, ignorant people," Sixsmith can't ignore the potential in the story and takes up the task of tracking down Philomena's boy, in the hopes of a reunion. The road begins at an abbey of nuns in Roscrea, County Tipperary, where Sixsmith and Lee meet with polite but firm stonewalling designed to protect both the Catholic Church and aging, ailing nuns. Nevertheless, in that grand tradition of journalism movies, answers—or, perhaps more accurately, bombshells—are forthcoming. So, too, is a showdown with the Church, but one that intriguingly deflates that grand tradition of tragic catharsis. Despite what sounds like awfully hard-hitting drama, Philomena is leavened by the buddy-comedy construct built on cynical modern atheist Sixsmith and sweet-natured traditional believer Lee. 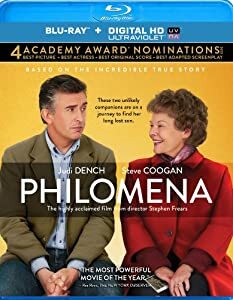 Philomena starts out blithe to Martin's witticisms, and Martin more concerned with the scoop than showing actual "human interest," but with time, each begins to see the other more clearly and investigate what makes the other tick. Though Coogan's the avowed funnyman, twinkly-eyed Dench makes beautiful comic music with him (ironically, as a woman whose sense of humor is lacking), and though Dame Judi's the classically trained tragedian, Coogan holds his own when matters get serious. The shrewd gaze and limber direction of Stephen Frears (The Queen) help to protect Philomena from getting too precious, despite a ripped-from-the-headlines, well, human-interest story that could easily have played like a bad Lifetime movie. Despite cheeky talk of "evil nuns," Philomena is careful to suggest that not all the nuns were bad. Still, Philomena fairly raises hackles about yet another shameful injustice at the doorstep of the Catholic Church. Anchor Bay presents Philomena in a Blu-ray + Digital HD UltraViolet special edition that offers terrific A/V and substantial bonus features. I can find no fault with the A/V specs of this newly minted transfer of a new film. The outstanding picture quality excels in palpable textures and sharp detail, abetted by a deep black level that anchors the well-calibrated contrast. Colors are rendered accurately, and the transfer ably handles the somewhat rougher-edged flashback sequences (partly shot in 16mm and even Super 8) without succumbing to compression artifacts. Likewise, the lossless DTS-HD Master Audio 5.1 mix leaves nothing to be desired. Dialogue is always well-prioritized and clear; immersive surround effects create realistic sonic environments for outdoor settings, hotels, airports, a carnival, and even the Lincoln Memorial; and music offers a full-bodied dynamism with a convincing low-end. Bonus features also please, beginning with a feature-length audio commentary with writer/actor/producer Steve Coogan and screenwriter Jeff Pope. Coogan has been around the world promoting the picture, and as the co-writer of the screenplay, producer and co-star, he's well-prepared to discuss all aspects of production. It doesn't hurt that Coogan is a witty guy, and Pope holds his own as the two discuss the project's real-life origins, their writing process, meeting with the real Lee and Sixsmith, and the various approach to getting the story on film in terms of script, performance, and even the score. "A Conversation with Judi Dench" (8:54, SD) covers a fair amount of ground in nine minutes, including not only playing Philomena Lee, but also the career that got her to this point, from her Shakespearean days to the James Bond franchise. "The Real Philomena Lee" (2:47, SD) amounts to little more than soundbites from AFI Fest. It's surprising that the real Lee is heard from the least on this disc, which seems a missed opportunity considering how much promotion Lee participated in for the film (especially when Dench couldn't be present). "Q&A with Steve Coogan" (24:17, SD) is a terrific Guild Screening Q&A moderated by Timothy Blake in Los Angeles in December 2013. This covers similar ground to the commentary, but it's a nice, enjoyable, meaty video bonus all the same. All site content © 2000-2019 Peter Canavese. Page generated at 04/25/2019 02:40:14PM.